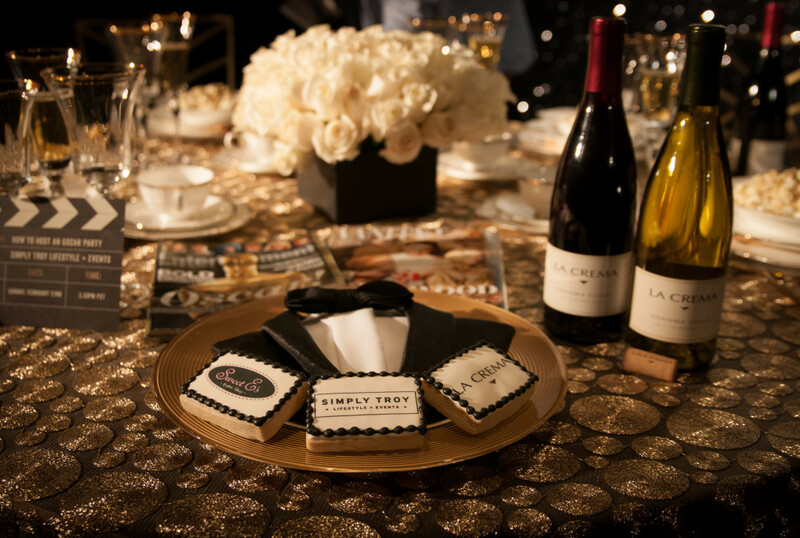 Creating a stunning Dessert Bar with various delectable + dazzling desserts is a bona fide winner for any award show viewing party! 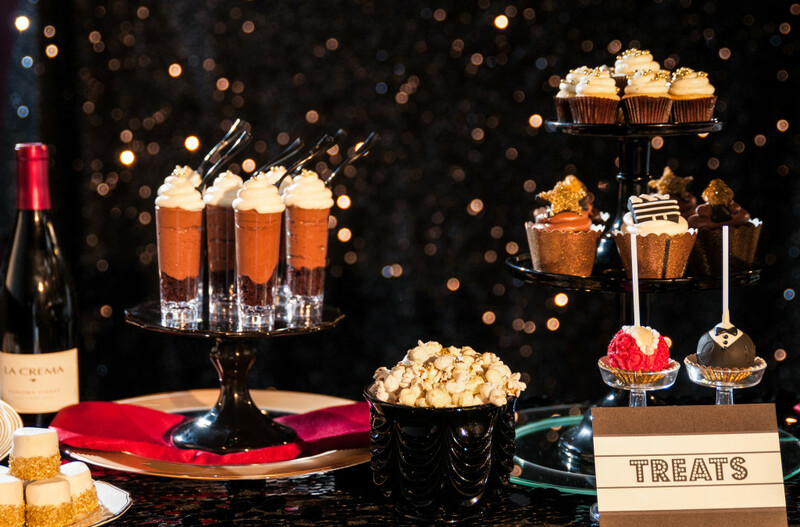 Join our friend and Hollywood Event Designer, Troy Williams to make sure you have all the most stylish desserts for your award show party this Sunday. 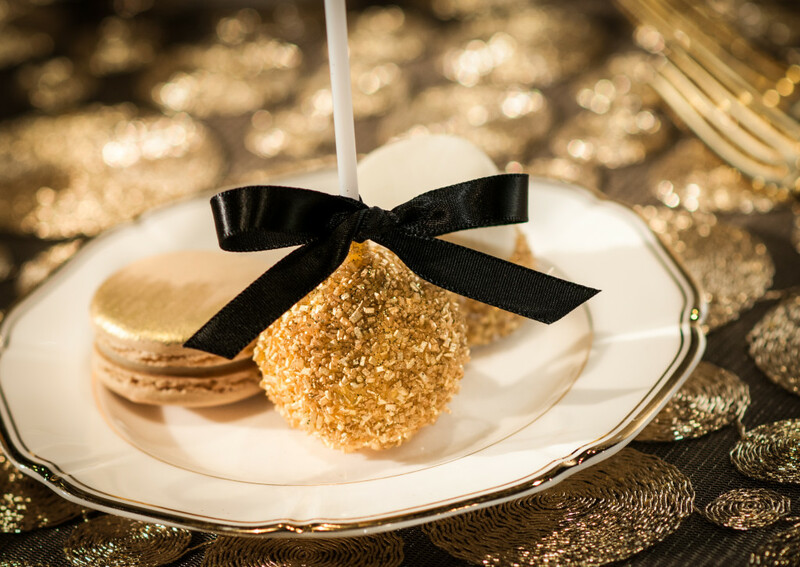 Sweet E’s Bake Shop created a dazzling dessert display for us that you can showcase at your own award show viewing party and they were kind enough to share their easy recipe on how to create cake pops with award-winning bling! This Hollywood Award Show Cake Pop recipe is super easy to make and doesn’t require any fancy equipment like a cake pop maker. The one specialty item you’ll definitely need to make this treat Academy-worthy are gold sprinkles. We found them at craft stores like Michaels or Jo-Ann stores, but you also can check your neighborhood cooking supply store as well. Bake a cake using your favorite recipe or boxed mix. Follow the recipe instructions + once the cake is fully baked, let it completely cool. After the cake is cooled, crumble it up into a large mixing bowl using your hands. Then mix in about 1 full can of your favorite frosting until it has the texture of a fudgy brownie. Put your tray into the freezer for at least 1 hour until the cake feels firm. Add gold sprinkles or colored sugar while the chocolate is still wet. 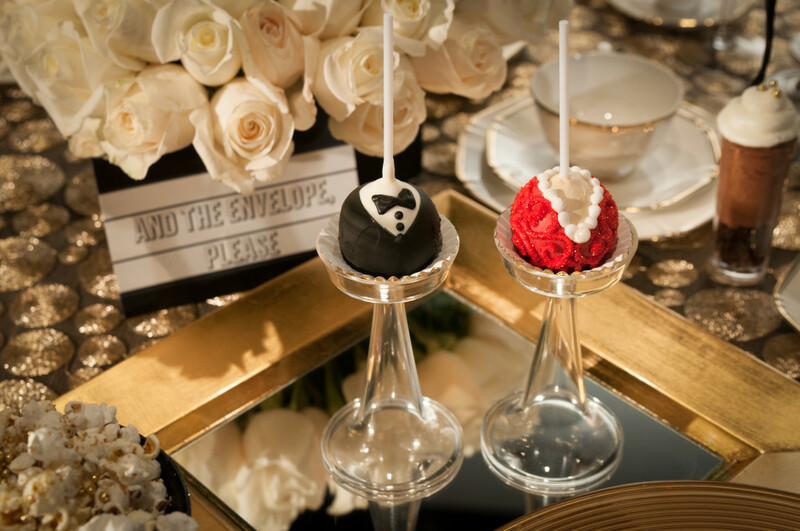 Or dress up your cake pops even more + get extra creative by designing an edible tuxedo or red carpet gown for them. After decorated, set aside to dry for approx. 5-10 min. Pass the Golden Popcorn, please! 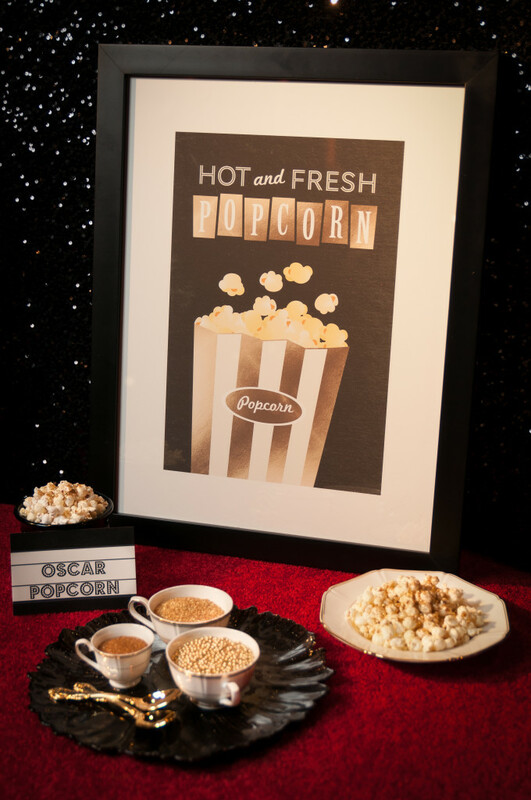 No award show viewing party is complete without hot + fresh popcorn, but for the biggest award show of the year you have to make it EXTRA special and throw some golden glamour it’s way. 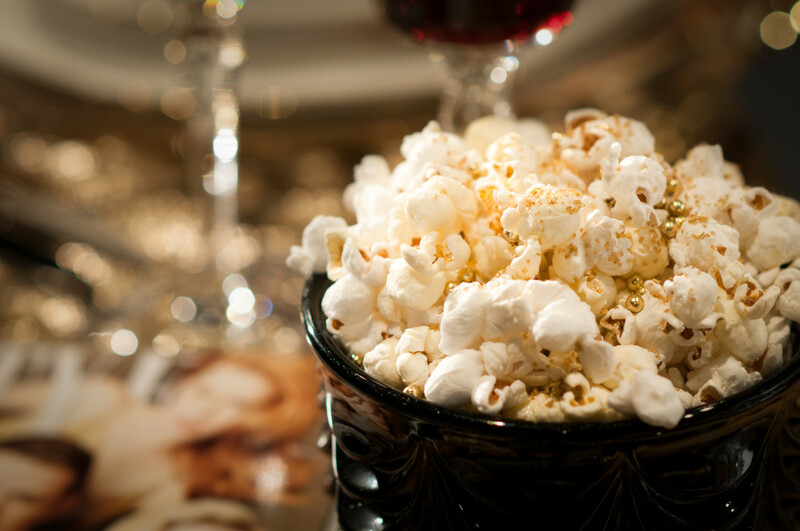 See the recipe below for how simple it is to create this “Golden” Popcorn to WOW your guests and give your dessert table an extra close-up of Hollywood style. Artisanal Popcorn in a bag. I personally love 479 Degrees. Check out all their cool popcorn flavors to impress your guests. Put popcorn in one of your display bowls + fill to the top. Lightly spray the popcorn with Cooking Spray. Make sure it glistens on the kernels. 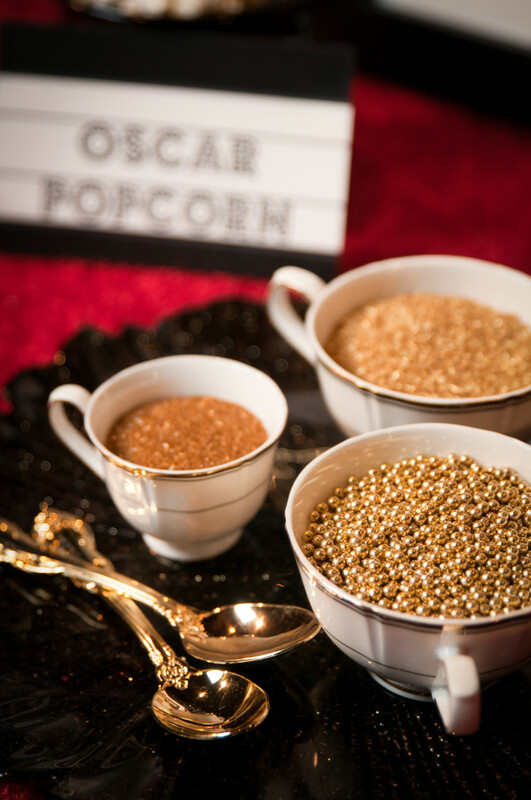 Lightly dust the popcorn with the Gold Edible Glitter, Gold Sanding Sugar + Gold Dragees Pearls. The butter will help these all stick to the popcorn. Display the bowls around your party + wait for your guests’ OOHs + AAHs when they see how pretty they look + they can actually try it too. Without a doubt, the rest of your dessert table is also going to impress your guests when you add these delightful confections to the mix also. Logo Cookies are the extra special attention to detail at your party that guests will be blown away by when they see them. *TIP – Have them created in each of the nominated films or your favorite actor + actresses’ names to give your award show viewing party even more pizazz. Now is this an irresistible dessert bar, or what? Have a great time celebrating in style with all of your guests and be sure to toast the winners with La Crema wines this Sunday night!! Looking for a dessert idea worthy of a Hollywood award show? 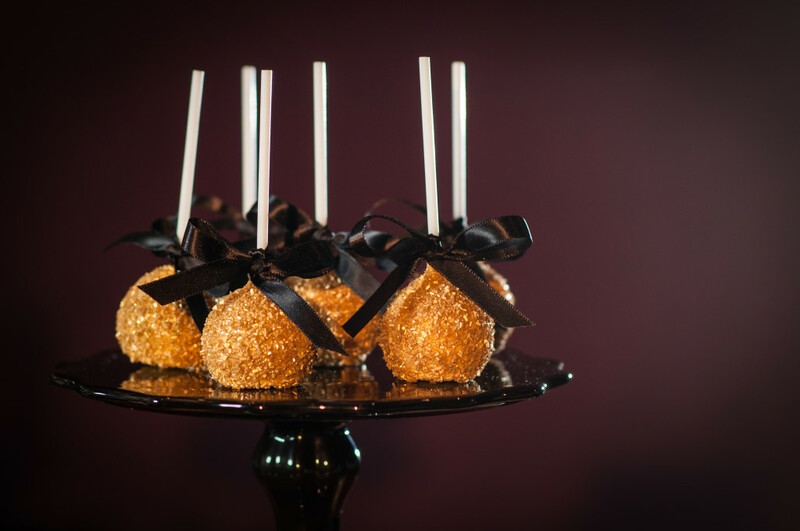 From Golden Cake Pops to blinged-up popcorn we have the ultimate guide to creating a dessert bar the Academy would be proud of. TROY WILLIAMS loves nothing more than to see a sparkle in someone’s eye when they realize their vision has been brought to life in a spectacular fashion by Simply Troy Lifestyle + Events. His attention to the details, both big and small, is consistently at an exceptionally high standard. He can make any not-so-simple job seem simple. Visit him at: http://simplytroy.com.